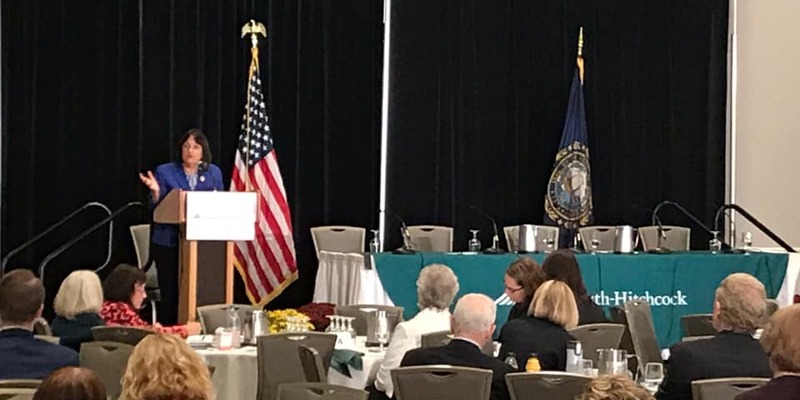 On Friday, I joined leaders in healthcare, education, nonprofits, and government to give remarks at the Dartmouth Opioid Collaborative Forum in Concord, where we discussed the impact of the opioid crisis on children and families and how to identify children who need help. In addition to passing legislation that provides support to children who are struggling, it’s so important to educate people about the signs of a child in need of assistance. I look forward to sharing the insights I heard at the Forum with my colleagues as we continue our work to combat this public health emergency. On Wednesday, I joined my co-chair of the Bipartisan Heroin and Opioids Task Force, Congressman Tom MacArthur, in applauding the final passage of bipartisan, bicameral, and comprehensive opioid legislation by the Senate. Congressman MacArthur and I have spent this Congress developing policies and crafting an agenda to better serve our communities. Our measures bolster support for education and prevention, expand treatment and long-term recovery, as well as law enforcement and interdiction efforts. These were addressed in this compromise bill and will soon make communities in New Hampshire more resilient against the opioid crisis. Passage of this legislation shows that when Republicans and Democrats come together to tackle issues facing our constituents, real progress and solutions are made. I introduced the Enhancing Veterans Experience with Telehealth Services Act (eVETS) last week to improve veteran access to post-traumatic stress disorder (PTSD) treatment via telemedicine. This introduction comes less than a week after the Department of Veterans Affairs reported an alarming surge in the suicide rate among veterans. In rural communities in New Hampshire, the nearest VA facility can be an hours’ drive away, deterring many from obtaining help. By rapidly expanding the VA’s offering of telehealth to these areas, I hope to address obstacles that have kept far too many veterans from receiving care. On Wednesday, I signed on as a cosponsor of H.R. 6824, the Online Sales Simplicity and Small Business Relief Act. This bipartisan legislation was introduced by Congressman Jim Sensenbrenner as a response to the Supreme Court ruling in June on Wayfair v. South Dakota, and it would provide relief to retailers with more limited revenue by exempting them from collecting sales tax for other states. It would also put a reasonable timeline in place for when larger businesses are responsible for collecting. I’m pleased my colleagues on both sides of the aisle put politics aside and introduced this much needed check on the scope of Wayfair v. South Dakota, and I will continue to advocate for small businesses by fighting unfair and unnecessary tax regulations. As always, please do not hesitate to reach out to my Washington, DC office at 202-225-5206 or my Concord office at 603-226-1002 with any questions, concerns or ideas you have. Thank you for everything you do to make our state such a great place to live. I hope you have a good rest of the week!